Stay informed on the latest bike news and events in Santa Cruz County, and ways to support the next great bike projects. 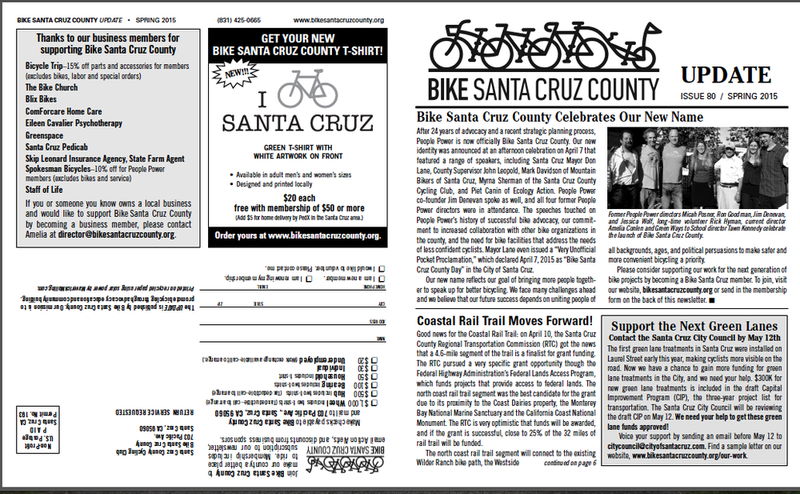 Become a member of Bike Santa Cruz County today to be notified of future campaigns and events. Membership contributions are what keep our organization running. Thank you for your support! Learn about what's happening at Bike Santa Cruz County through our quarterly newsletter, which highlights bike news, events, and profiles of bike-friendly local businesses. We respect your privacy and send out e-mails only for major events. "Santa Cruz council pushes forward with rail trail segment"
"Santa Cruz County celebrates new cyclist safety law"